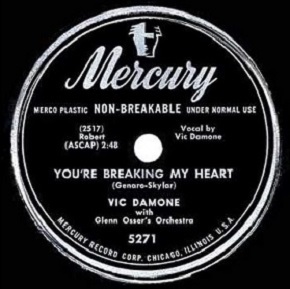 You’re Breaking My Heart, with a section sung in Italian by Vic Damone, is the #1 record the entire month. It was originally called Mattinata, an Italian song dating back to the early 20th Century which had been refashioned with English lyrics in 1948. Damone, (born Vito Rocco Farinola… he used his mother’s maiden name professionally), was the son of Italian immigrants giving his rendition an authenticity that the competing Top Ten versions by The Ink Spots and Buddy Clark couldn’t muster. 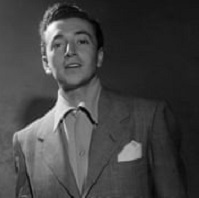 Damone had risen to fame upon winning Arthur Godfrey’s Talent Scouts in April 1947 and was signed to a contract with Mercury Records soon after. 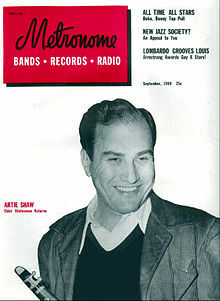 After a pair of Top Ten hits right out of the gate he slumped somewhat in 1948 before rebounding in 1949 with the song that would become Damone’s signature performance in a career that included twelve Top Ten hits among his more than 50 charted singles. After becoming a television regular in the 1960’s, both in acting roles and as a guest on variety shows, he became a featured attraction in Las Vegas during the 1970’s and continued singing until a stroke in 2002 forced him to retire after recording more than two thousand songs in his lifetime. Nearsighted Mr. Magoo makes his debut in the cartoon short Ragtime Bear. 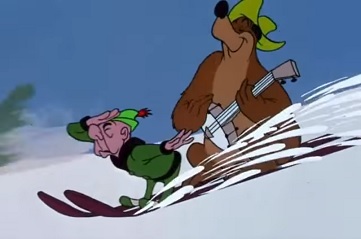 In this original incarnation Mr. Magoo was crotchety old man who constantly berates his dimwitted nephew Waldo, eventually thinking he shot him when a music loving bear, having taken Waldo’s place unbeknownst to the myopic old man, keeps playing a banjo despite threats by Magoo to stop. It would take awhile for Magoo to mellow and become more of a blissfully unaware and harmlessly eccentric lovable kook. His look was a little rougher at this point as well, showing him with more angular facial features while often frowning in disgust, but the premise revolving around escalating series of misunderstandings due to his lack of sight that get more outlandish as each story unfolds – this one finding him flying through the air after being bowled over on a ski jump – were present from the very start. The cartoon’s humor, even when he is far more short-tempered and insulting early on in his evolution, was largely thanks to the inspired characterization by actor Jim Backus, a role he played throughout its history and for which he’d forever be remembered. Looking for something a little less harrowing than a blind man tangling with a musical bear in your trip to the movies? 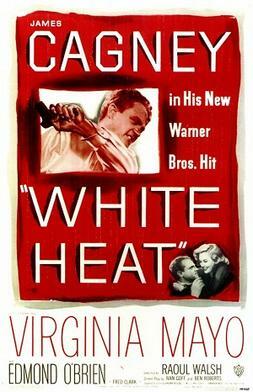 Then buy a ticket to see James Cagney in one of his most legendary roles in the gangster classic White Heat. Directed by Raoul Walsh the twisting plot concerns Cody Jarrett, a psychopathic criminal with a mother fetish who shoots his way out of trouble and then connives his way into an airtight alibi for a job that resulted in four dead men by confessing to another crime committed at the same time in another state. After finding out his beloved mother has been murdered (by his girlfriend no less!) and having survived an attempt made on his life while in prison that had been set up by a member of his old gang looking to wrest control from him, Jarrett breaks out of jail in an elaborate plan and heads west to settle old debts with his ever-present guns. Metronome, a music magazine dating back to 1885 which by the 1940’s courted a younger readership with a focus on jazz, had been tallying votes all summer in their attempt to find out their all-time favorites in the field. The greatest song was deemed to be 1929’s Stardust, a Hoagy Charmichael tune that had been revived numerous times in the ensuing two decades. However their choices for greatest artists were more recent with Duke Ellington credited with having the best band, Benny Goodman being named the greatest instrumentalist, Billie Holiday won the accolades for being the greatest female singer while Billy Eckstine was afforded the honor of being the greatest male singer. Metronome was also renowned that decade for gathering the top artists of the year to cut two songs together resulting in some of the most staggering jam sessions imaginable. As one of the first mainstream outlets to publicly embrace be-bop it’s not surprising that 1949’s session would include Dizzy Gillespie, Charlie Parker, Fats Navarro and Buddy DeFranco, along with Miles Davis, Charlie Ventura and many others, all in the studio together laying down one impressive solo after another. The magazine ended its impressive 76 year run in 1961. This month will be the last in which radio programs are allowed to give away prizes. The Federal Communications Commission voted 3-1 to stop the programs which entice audiences to listen by giving out five million dollars worth of gifts a year. The Commission ruled these prizes constituted a lottery and therefore are illegal. 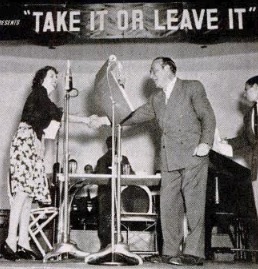 Shows such as Take It Or Leave It which introduced the “$64 Dollar Question” to the American lexicon in 1941, had become exceedingly popular over the last decade or so and allowed listeners to call in to win prizes which might be anything from a turkey to a diamond ring (husband not included) just by answering a few questions. The gimmick of course is you had to be listening and that’s what radio was after now that television was eating into their audiences and the lure of prizes was one such way radio attempted to stem the tide of those migrating to the newer medium. From now on if you want a free automobile or refrigerator you’ll have to steal them like everybody else… at least until television finds a way around these edicts with quiz shows of their own in the 1950’s. Since you can no longer get free grub just by listening to radio starting next month, what better time to make the switch to television? 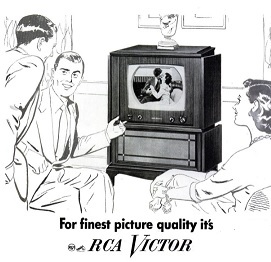 You’re in luck too because a 16 inch wide screen RCA television console sells for $429.50. Like large floor model radios before it, televisions were advertised as “a fine furniture piece” and so they spend as much time hyping the “strikingly handsome, hand-rubbed cabinet” as they do the purpose of owning a TV which presumably was to watch programs on it. They don’t forget it altogether though as they tout its impressive screen size as being “as large as the magazine page you are reading!” Gosh, that is pretty big. What are you going to watch on those giant 16 inch television sets? How about The Lone Ranger which makes its debut on ABC television. In 1949 ABC was the floundering fourth television network in desperate need of hit programming and looked to their radio stable of shows to find something suitable. The Lone Ranger had begun on a local Detroit radio station in 1933 and quickly became a runaway hit with both children, whom it was initially intended for, as well as adults. It was picked up nationally on the NBC Blue Network in 1942 which in time became ABC, on its way to nearly 3,000 total episodes, not to mention books and movie serials in the 1940’s. 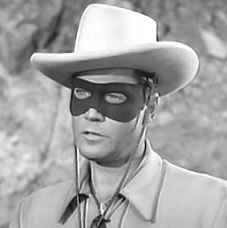 The show was re-cast for television with Clayton Moore donning the mask as he sought to bring evil-doers to justice (while never shooting anyone with the intent to actually harm them and while always using proper grammar). With blaring trumpets playing The William Tell Overture and a breathless announcer heralding his arrival each episode with the familiar words, “A fiery horse with the speed of light, a cloud of dust and a hearty ‘Hi-ho, Silver’… The Lone Ranger”, the show captivated TV audiences seeking action and became ABC’s first legitimate hit series. Seventy-eight episodes were made and production for the series seemingly came to an end. But when those original 78 shows were re-aired and captured the same sizable audience they decided to film another season in 1952. However they became embroiled in a contract dispute with its star and so John Hart was enlisted to replace Moore as the masked hero for the next 52 episodes. Its popularity declined with the new man behind the mask and when the rights to the show were sold in 1954 the new producer rehired Moore for the last three years of episodes. Jay Silverheels played Tonto for the entire run as well as co-starring in two Lone Ranger films starring Moore, one of which was released the year after the show left the air in 1957 by which time ABC had established itself as a viable television network. It also led to the what was long considered to be the single funniest TV story ever told which Jay Thomas would eagerly recount each Christmas on The Late Show With David Letterman, involving a stoned Thomas and a stoic Clayton Moore, forever in character as the iconic Lone Ranger. It was a case of in one hand and out the other for the insurance industry. 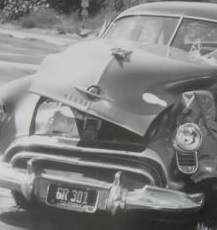 As Samuel Bachinger of Pompano, Florida was dutifully paying his premium at the insurance broker’s office, the company’s large sign blew off the front of the building in a gust of wind and smashed into Bachinger’s Oldsmobile parked out front. After handing over the check for the car’s insurance he then asked to file a claim for the damage to his automobile. The aerosol dispensed whipped cream was invented by Aaron “Bunny” Lapin from St. Louis who’d initially created Sta-Whip during World War Two which used vegetable fat along with light cream because of the war time shortages of heavier whipped cream. His early attempts at a canister to deliver the contents were crude but in 1946 another company invented the seamless aerosol dispenser and Lapin immediately took advantage of it. Originally sold in St. Louis the product spread nationwide by 1949 and within a few years he was a millionaire and in 1998 Time magazine named him one of the 20th Century’s Most Influential Inventors… for THIS?!?! 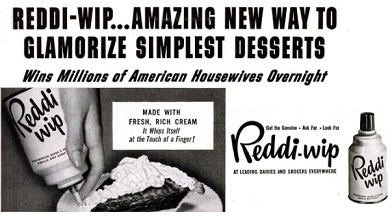 Then again its ads claim that women rave about it as they no longer have to clean the bowl or beaters by making it themselves which is why smart housewives keep it on hand in the refrigerator and their men “love the glamour” that Reddi-Wip gives to plain deserts!